He also has been appointed chair of the Electrical Engineering Department at the University of Washington. At Maryland, Poovendran was advised by Professor John Baras (ECE/ISR) and received the ECE Department's inaugural Graduate Student Service Award (1999). He also won NSA's LUCITE Rising Star award in 1999. He joined the University of Washington faculty in 2001 and became a full professor in 2010. Poovendran also is the recipient of an NSF CAREER award (2001), an ARO Young Investigator award (2002), an ONR Young Investigator award (2004), a PECASE award (2005), and was named a Kavli Frontiers Fellow of the National Academy of Sciences (2007). 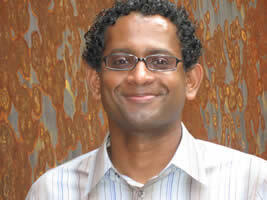 Poovendran is the founding director of the Network Security Lab (NSL). His research interests focus on communications, network security, and cryptography.